The leader of the Iowa National Guard says the unit is the most seasoned in the history of the state. Adjutant General Timothy Orr delivered his fifth Condition of the Guard Address before state lawmakers today. “I’m proud to report that the Iowa National Guard continues to be mission-focused and warrior ready,” Orr said. More than 4,000 currently serving soldiers and airmen are combat veterans, nearly 45-percent of the force, according to Orr. 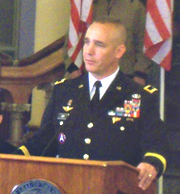 “As we near the conclusion of America’s longest, continuous period of war, a time also marked by natural and manmade disasters of magnitudes rarely seen in any similar period of our state’s and nation’s history, the Iowa National Guard remains a proven, dual-mission force,” Orr said. Forty-four of those who returned from deployments received medical care over the past year for wounds or injuries suffered overseas. Orr received a standing ovation when he said that, after 12 years of war, all Iowa National Guard units are home from Iraq and Afghanistan. Approximately 100 Iowa Guard soldiers are currently deployed in other locations around the world. Orr said two guard units have received notification for potential deployments later this year.